after being adopted, Hocus took flight from her new family’s yard when her harness slipped off. She did not dart away, but rather lingered around the yard and immediate area, but her family was not able to contain her again. They left food out and some clothing and immediately contacted the authorities once night fell and she was no longer seen. Hocus’ family and her former foster mom began an intense round of awareness of Hocus and her flight. Facebook was the number one tool used, along with flyers and intersection signs. 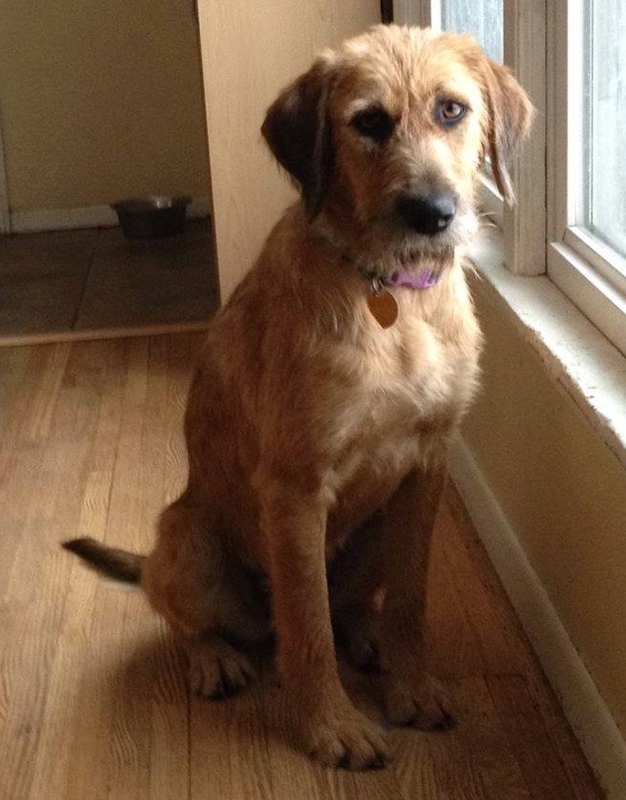 It was not long before many people knew Hocus’ story and that she was missing. The day after leaving she did return to her yard, but again they were not able to get their hands on her or contain her. With the awareness, many calls with sightings started coming in. She was still remaining in the area and the hope was that she would return again to her yard. 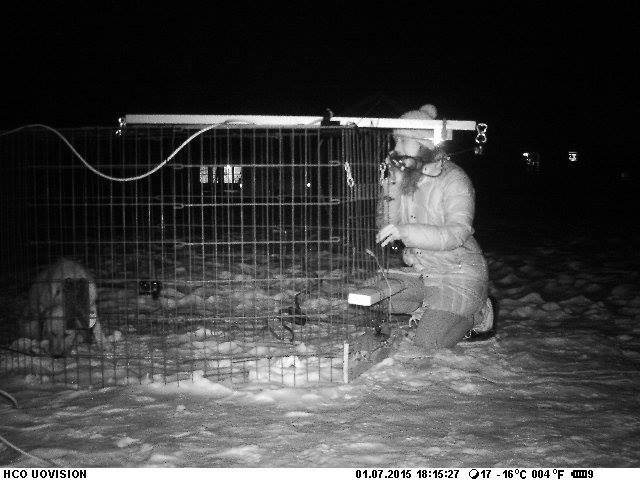 This is when they contacted The Retrievers and we set out one of our traps. 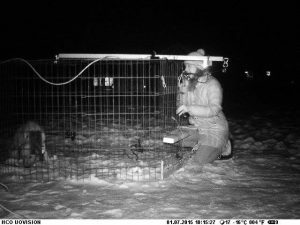 Most of our traps were already out on different cases, but we were able to get one together that was a converted Xpen using our sensor and magnet set up. 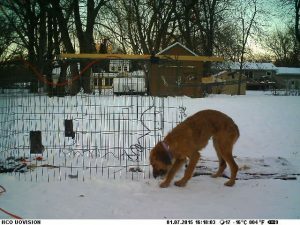 Hocus took flight on a Friday afternoon and Sunday evening, the trap and our cellular trail camera were in place in her new back yard. Over the next few days, there were many more calls with sightings. Some near. Some upto a mile away near a busy intersection where she was seen crossing several times a day. The awareness was increased and a local TV station even did a news story on Hocus because of all the awareness of her story (You can never have to much awareness). It was now Wednesday afternoon and there had been no action at the trap, and no photos of Hocus from our camera. By all accounts she had moved her safe area about a mile east where most of the sightings were coming from. 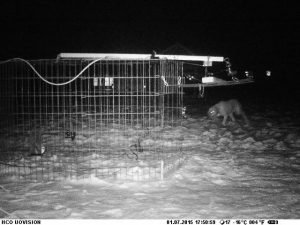 I spoke with the owners and moving the trap the next day was decided to be the plan, along with setting out a second trap. Both traps would be near her new safe area. Darkness fell and it was about 90 minutes after she first reappeared at the trap. 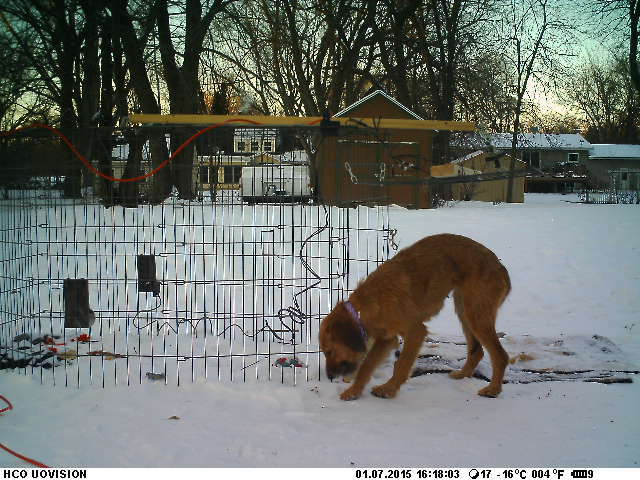 Our camera once again sent some photos of her approaching the trap. I was on the phone with her foster mom, who was inside the owner’s home with them watching out the window (they had all their lights turned off). It was at that moment , at 6:15pm on Wednesday, that Hocus went into the trap and was captured. They quickly got out to the trap and Hocus was scared at first, but she was not panicking or putting up a fight. She was shivering and once she recognized her foster, she wanted out to greet her. They safely removed Hocus from the trap and got her inside to warm up and get some more food and to decompress a bit. Considering she had been gone for 5 days and in very cold conditions, she was in good shape and had only lost a few pounds. This story is a great one to write and read. They key to capturing Hocus was all of the awareness out there. So many people came together and were calling in the sightings and doing the right thing (not chasing her). It was truly a team effort and that effort paid off in the end. 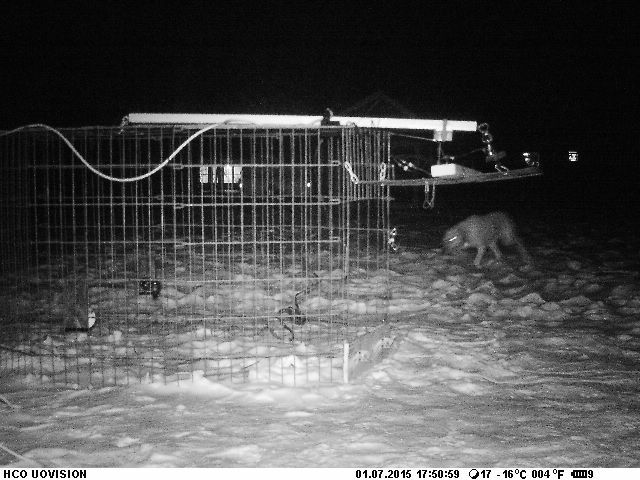 The interesting fact is that Hocus was captured in the trap literally minutes after her story was played on the local TV station news…. Happy ending for Hocus and her new family. She is doing well and is all rested up again.